Unlike women in the rest of the developed world, women in the United States are at greater risk of dying from childbirth-related complications, according to the Centers for Disease Control and Prevention (CDC). More than 700 women die each year in the United States due to childbirth-related complications. The CDC’s National Vital Statistics System ranks the United States 46th in the world for maternal mortality. Arkansas’ maternal death rate is the third highest in the nation with 35 maternal deaths per 100,000 live births annually. The national average is 20 deaths per 100,000 live births. 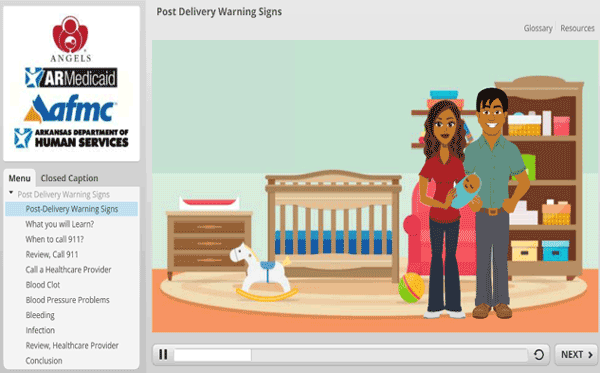 Post-delivery is an important time to make sure mom and baby are healthy. It is important for women and their family members to be educated about the warning signs that can potentially cause maternal death. Education is vital to successfully reduce and prevent maternal mortality and morbidity. Moms need to be aware of the many changes their body goes through during pregnancy and delivery. While there will be discomfort, soreness and fatigue, they must understand that some conditions need medical attention. New mothers should be empowered to know and understand post-birth warning signs and encouraged to trust their instincts about their bodies. Together, we can make a difference and decrease the number of families tragically affected by maternal mortality. America’s Health Rankings: Health of Women and Children Report, 2016. America’s Health Rankings Maternal Mortality Trend in Arkansas, 2018. Special Series- Lost Mothers: Maternal Mortality in the U.S.